Identify potential habitat for lyrebirds within Tasmania, and map their currently known distribution. Investigate links between lyrebird foraging behaviour (scratching) and fire risk within Tasmanian forests. Further, I will expand contemporary knowledge on the lyrebird’s ecosystem influence within Tasmania, by adding to the work undertaken by Sarah Tassell (PhD) and Zoe Tanner (Honours). Based on environmental variables of the superb lyrebird’s native range (Vic, NSW, ACT & Qld), what would the superb lyrebird’s ideal habitat and eventual geographical distribution be within Tasmania? When mechanically working the leaf litter layer (surface fuel for fire) can lyrebird behaviour influence the accumulation and distribution of litter biomass between open plots (lyrebird presence) and exclusion plots (lyrebird absence). If lyrebirds are influencing leaf-litter biomass within forests, does this influence the potential severity or frequency of fires in that landscape? A species distribution model (SDM) will be based on known climatic and habitat parameters for superb lyrebirds in their native range of mainland Australia. From this, predictions of suitable habitat within Tasmania can be made and referenced with existing historical records (acknowledging that lyrebirds continue to expand their Tasmanian range after initial 20thcentury introductions in two locations). Identified key habitat areas from the SDM in Tasmania will be referenced with Tasmanian lyrebird observations (Natural Values Atlas of Tasmania, Birdlife Australia [TAS], Atlas of Living Australia). Observational records will be matched with environmental data to develop a model that can predict lyrebird distribution based on habitat preferences (local ecological variables and climate data), and overlayed onto Tasmania to identify key habitat areas, this can be checked against current Tasmanian observational records. Exclusion experiments will be used to quantify the influence of lyrebirds on leaf litter (surface fuel loads) within occupied sites by comparing treatments, and between occupied and control (absent) sites. Data will be collected from sites occupied by lyrebirds (lyrebird sites), from within their known range and areas immediately beyond their known range (e.g., lyrebird absent control sites) by utilising a paired exclusion and open-plot design between each site. A procedural control (two-sided fence) will be used to quantify the effect of fencing on the accumulation of leaf-litter. 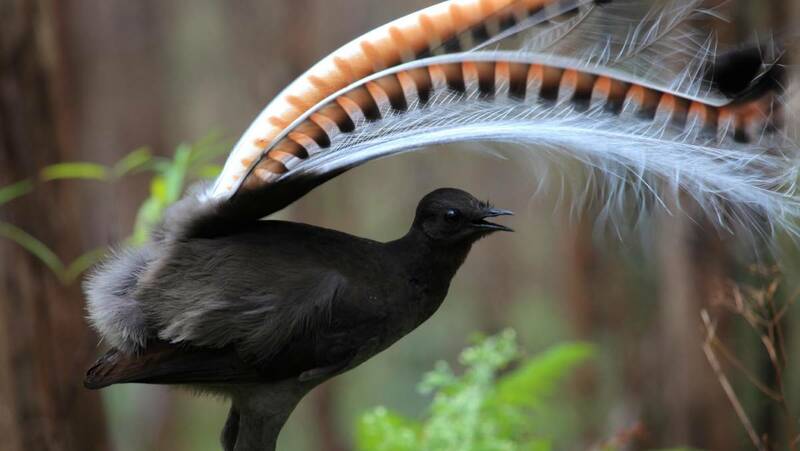 Site selection: sites will display characteristics typical of lyrebird scratching, site variables are measured at commencement of the projects experimental period and again at the end of the experimental period. Lyrebird field sites are located at: ×1 Brown Mountain Reserve, x1 Raminea, x2 Hastings. Site variables to be measured include: mean litter depth, percentage litter cover, litter moisture content, percentage canopy cover, lyrebird scratching percentage (scratching intensity), tree species composition, tree biomass, tree density, fire history. Data will be collected using a mixture of methods described in the Overall Fuel Hazard Assessment guide from the Victorian Department of Sustainability and Environment, and methods for estimating environmental variables from Sarah Tassells PhD thesis (Braun-Blanquet Index for percentage cover of relevant variables). Control sites free of lyrebirds will be areas beyond the lyrebird’s current distribution x2 in Wellington Park and x2 on Bruny Island. Biomass data (measurement and litter collection) will be taken at random from within the 3×3 meter treatment plots. There will be ×4 lyrebird sites and ×4 control sites, giving a total of eight sites. Each site will have ×3 replications of each treatment (×3 exclusion plots, ×3 open plots, ×3 procedural controls) for a total of 24 replications of each treatment. Field surveys will also be undertaken at each site. Within a 50m x 50m quadrat (.5 hectare), x 5 intercept lines (250m of transect) will be used to investigate lyrebird scratching. Along the transect lyrebird scratching presence or absence will be recorded at one-meter intervals and local variables will be quickly recorded, such as: scratching intensity, extent of scratching, age of scratching, vegetation structure, local species, slope etc. This may allow us to determine lyrebird influence over a greater area, but also link lyrebird foraging to local environmental factors. A quadrat at one of the field sites. Fire risk will be modelled using the McArthur Mk5 Forest Fire Fuel Model – described in the Overall Fuel Hazard Assessment guide from the Victorian Government (Department of Sustainability and Environment). This requires the following data to be collected from each site (Lyrebirds & Control): fuel dry weight (g); fuel dry weight (t/ha); water content (%); total fuel (t/ha); Canopy height (m) for lower and upper canopy, and ground slope (°). Note that measurements will be done at the commencement of the exclusion experiments (during autumn at the end of the burn season when it is not so wet). This data can be used to determine the behaviour of a fire in the respective sites. Exclusion experiments will compare the amount of leaf litter biomass from each site using a contingency table approach and Generalised Linear Modelling (GLMs) using multi-model inference. I will also use these methods to explore the relationship between lyrebird’s occupancy and biomass, and the measured variables at each site (litter depth, litter cover, litter moisture, stand age, time-since-fire & tree species composition – as detailed above). Comparisons can be made between lyrebird occupied sites to unoccupied sites, and within site variation between treatment plots. Fire behaviour modelling can predict the intensity of a potential fire from the input parameters mentioned above. From this we can assess fire risk from each site and each plot treatment (Exclosure vs Open). Flame height will be used as representation of fire behaviour, because it is influenced by fire intensity (energy output) and severity (biological impact).